Live every day like it's vacation! Make this gorgeous and unique custom ranch home, nestled in the peaceful mountains of Larkspur, your own. 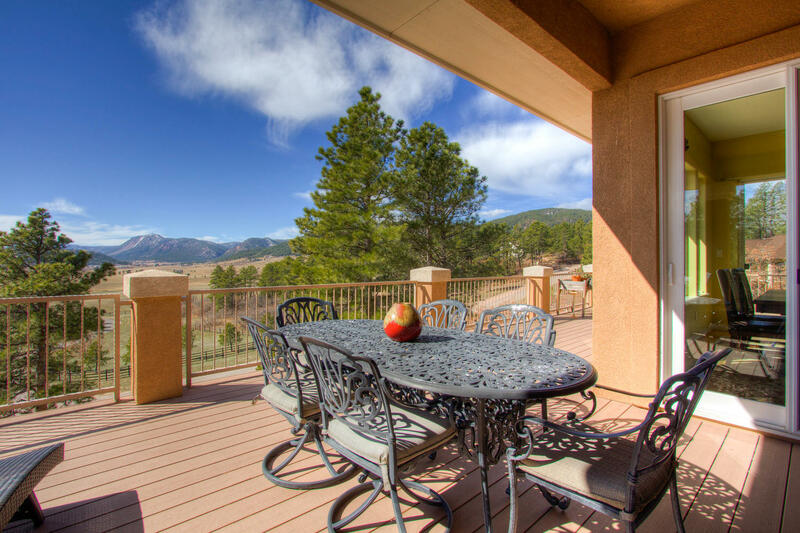 Imagine yourself sipping coffee from one of the sunny decks overlooking Spruce Mountain Ranch and the nearby ranges while deer scamper below. 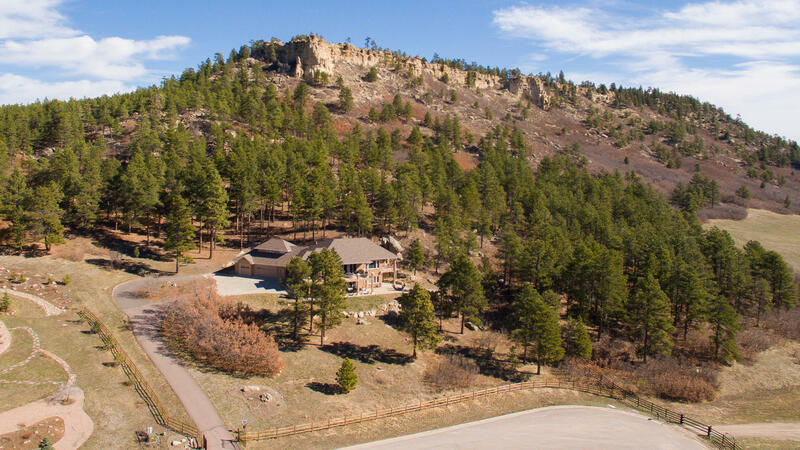 A quiet sanctuary to escape the busy life but remaining mere minutes from Denver, Castle Rock or Colorado Springs. 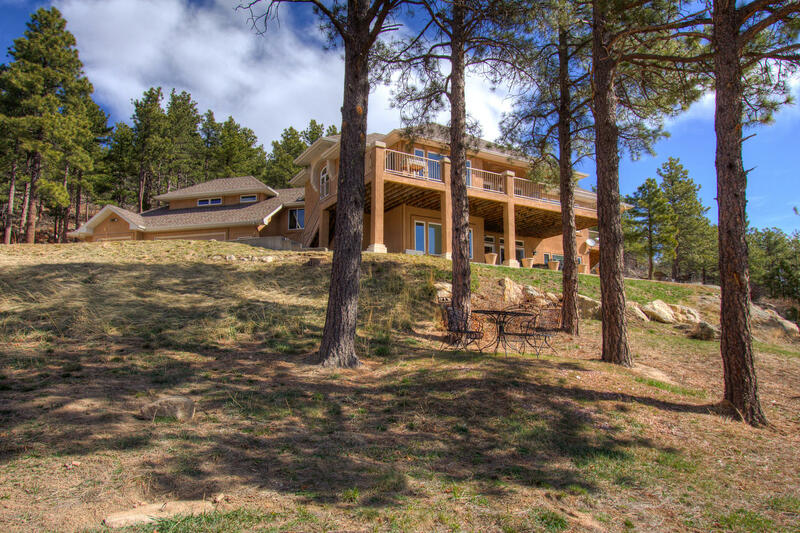 Virtually every room in this home features breathtaking mountain and valley views from every window. 5 bedrooms and 6 bathrooms can be found among the nearly 4800 finished square feet. On the main level there is a large open kitchen with black GE Profile appliances, granite countertops, a dining area and a spacious great room complete with hard wood floors and inviting fireplace. The master bedroom, complimented by it’s own private covered deck, features a double sided fireplace, jetted tub, dual sinks in the master bath and a large walk in closet which includes counter space for folding as well as built in drawers. Another large bedroom located over the garage has it’s own large bathroom and views you don’t want to miss. You’ll also find a study with French doors and a laundry \mud room complete with desk space just off the garage on this level. The spacious lower level walk out is finished beautifully as it’s own separate living space complete with seperate entries, security locks and coded entry doors. On this level you'll find three bedrooms, 2 of which are Master Suites with attached bathrooms. Within them you will find granite counter tops and high end finishes that compliment the beautifully tiled showers with frameless glass doors. The lower level kitchen is fantastically equipped with Stainless steel appliances, granite counter tops, built in wine rack and pendant lighting over the breakfast bar. Enjoy nature and the views from a large low maintenance deck on the upper level that can be accessed by any one of 4 large sliding glass doors. Below is a huge partially covered patio, with a gas fueled fire pit perfect for roasting marshmallows while you watch the fireworks display over Palmer Lake. · 20kw Generac whole house backup generator. · Built in speakers with volume control in master bedroom, master bath, study, upper and lower decks as well as the backyard. · A\V Closet in lower level to tuck away tv and stereo equipment. · Lower level bedrooms and living room prewired with coax & HDMI. · Honeywell Security System with smoke monitoring serviced by Pikes Peak Security. · Separate Furnaces for the main and lower levels. · Dual 50 gallon tank style water heaters installed in sequence will ensure you and your guests will never run out of hot water. · Convenient access to the garage directly from the lower level making mechanical room repairs and deliveries very convenient. · Mechanical room access from garage. · Long life painted stucco exterior. · Sprinkler system to lawn and garden areas. · Washer\Dryer hookup on lower level in mechanical room.